The reports listed below are the minutes of the Annual General Meeting and the asssociated reports prepared by the Officers of the society and which are reported to members during the Annual General Meeting. 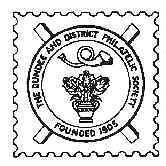 The reports are only available only to Dundee and District Philatelic Society members. The reports are in format. They are displayed in a new window. Closing the window returns you to this page. This page was last modified on 14th August 2018.